Many thanks to Ji-in and Jae Ran for the inspiration. Will probably continue to tweak as time goes by. “You should take better care of yourself,” she scolds, “you’re not any good to anyone wearing yourself out like that. Coffee is bad for you!” Her English is still heavily accented. She’s only been in the US for a few years having come from Korea to pursue a PhD in Art…something. We’d met through mutual friends not long after the birth of my fourth child and had become fast friends. I loved her independance and strong will, the fact that she knew exactly what she wanted in life and went for it without fear. She was everything I’d wanted to be. I guess I was the family she lacked being so far from her birth country. We had little in common but for some reason were drawn together and have been like sisters ever since. “Ohhh, you’re so bad!” she grins. Soo is use to my sarcasm and dark humor by now. She’s familiar with my story and how I feel about events in my life. She’s not adopted but grew up in Korea with a Korean family. What she lacks in understanding regarding my adoption experiences, she makes up for in compassion and acceptance. “Oh my god, Soo. You’re Asian!” I holler with a wide-eyed expression, “I can’t believe I have another adult Asian in the house!” Deep understanding of my sarcastic statement is lost to her. How do I explain that my friendship with her still feels like a kind of forbidden fruit unwelcome in the great, white world of my childhood? How do I express what it means to stare across the room, see another Asian face and be able to call her not only “friend” but “sister”? She is the closest I thing I have here so far from my birth country. She laughs and shakes her head, “You’re so crazy. You need to get out more.” I smile hoping she doesn’t see the sorrow buried behind my humor. It would make her feel bad for me again. I write as she lists ingredients and instructions. The pen feels heavy. The tip of my thumb turns white from squeezing it too tightly, blood bleeding as black ink onto the surface of the paper. As I write, a not-memory seeps into the foreground of my thoughts. I roll my eyes as I take the knife from her, “You could have just put the slices straight into the bowl.” She walks away with a lecture on her lips but is in too big of a hurry today. It’s an old argument. I want to save time and make things easier. She believes perfection takes time and attention to detail. She says I’m impatient. I argue that she just likes to make things hard for the sake of it. “You’re going to invite me to dinner when you make it, right?” Soo asks pulling my thoughts from simmering phở broth to boiling sweet potato noodles. “Yeah…” she agrees seeming to drift off to some other place. The brief moment of silence that follows is welcomed as we retreat into our own thoughts. I wonder if she’s retracing her own memories as again my thoughts turn to my not-memories. Is she cooking japchae with her umma while I cook phở with Má. Perhaps she is impatiently staring at a pot of boiling sweet potato noodles as I stand tapping my foot in front of a bowl of simmering beef bones. The air is humid and heavy with the rich smells of beef broth, fresh basil and cilantro. “Má, is it done yet?” I ask again. Weary of my nagging, she doesn’t answer right away. “You don’t have to stand over it like that,” she insists, “No wonder you’re so impatient.” My eyes follow her as she leaves the kitchen but return to the stove where clinging bits of meat and encased marrow are sucked of their essence. Some of the flavor escapes on currents of steam. It’s enough to tempt the appetite but most is water-locked and will be condensed and served to make up for the teasing. Despite having more productive things to do, I remain in place and continue my vigil as the self-appointed guardian of disconnected flesh and fragmented bone. My personal opinions aside, I hope everyone had a wonderful Thanksgiving! Yes, I have issues with that particular holiday but will save that for another day. It’s been a busy month! Unexpectedly and thankfully, I was blessed with doing a magazine article and interview early in November for an upcoming issue. I wasn’t going to say anything until it was published but I’m so excited about it! I want to actually see the results before I plug it so for those of you who know about it, hush-hush please! All I can say for now is that it was a little intimidating but hopefully I didn’t totally moof the whole thing. Can you tell I totally lack self-confidence? Yeah, workin’ on it, I promise. 😉 Even before the editor contacted me, this magazine was one of my favorites. It’s groundbreaking, innovative, professional and the presentation is absolute eye-candy! I can’t say enough about how thrilled I was that they were interested in putting my perspective out there! Anyway, will put up a full plug once it’s out! Recently, I’ve been volunteering in my local library. It doesn’t pay but the perks are nice. Yes, there really are perks! The people I work with are great and despite what some might think, librarians are absolutely NOT boring and stiff. I enjoy the time I spend there both as a patron and a volunteer. Most of them knew me on a first-name basis before I started volunteering so it’s been a comfortable transition from front-desk to back-room. In the process, I figured out how to recommend purchases and of course sent in a request for Outsiders Within. Our library is terribly lacking in the adoption section. They can expect many requests from me in the future. Ahhh, I love my library! Please support your local public libraries! Adoptive parents often ask me if I think I’d have been better off left in an orphanage in Vietnam. Of course, I can never answer that question. Believe me, I’ve tried but there just isn’t a definitive answer when reach beyond the boundaries of “dying in an orphanage” as opposed to “flourishing with an adoptive family”. It just doesn’t work like that. When I reach beyond the standard framework, everything becomes reliant on the hypothetical. What if my mother were still alive? What if I’d been adopted by another Vietnamese family? What if I’d fallen into the human trafficking trade? What if my mother had come back for me? The list goes on forever, and there are no answers to any of them. Though their question is directed at me personally, I sense that some are really seeking to answer the question in a way that’s more personal to them. The hardest thing to say is, “I don’t know,” but that’s the only answer I can give. The reason I brought it up in the first place was to question those who claimed throughout my childhood, to know the answer by informing me of how I was so “lucky”. What did they really know? I was lucky in one sense but what exactly made me so fortunate? What did they see beyond my physical health, seemingly well-adjusted behavior and material gain? They never considered the fact that in order to be so “lucky”; I’d had to lose everything except life and limb. What I had lost meant nothing to them. My heritage, my identity, my birth-family and my connection to all of those had value only to me. Recently, I managed to get in touch with the other Viet-adoptee I’ve mentioned. I have to confess I’d been wrong about him in many ways and am glad we cleared up some of our misunderstandings. He told me some of his own story which is, in many ways, more tragic than my own. That’s his story to tell when he chooses, but my point is that in light of his story, one could assume that I was indeed better off than him. Given the fact that he went back and found his birth-family, I would disagree. It’s something I may never be able to do given the questionable circumstances of my “adoption”. The gains only balance the loss depending on how much value one puts upon each. It’s not as simple as “I lost a family/I gained a family”. One cannot cancel out or replace the other. The loss of my birth family will always leave a void. Even if I, by some miracle, found members of my birth family, closing the gap created by time apart and differences in language and culture would be next to impossible. I’m sure I would again enter the scene as the outsider sneaking my way in through the back door. Underlying that unanswerable “better off” question, some adoptive parents and potential adoptive parents seem to really be asking, “Should I adopt?” I’m not the person to ask. I don’t know the people asking these questions nor do I know their circumstances beyond what they tell me. That’s the kind of question they need to answer within themselves after a hard look at the world around them and into their own hearts. Sometimes, I feel that adoptees who chose to speak out are asked to carry a burden that is not ours to carry. We are asked to offer answers and solutions to problems that many of us barely understand ourselves. When we don’t have the answers, we are then dismissed as simply wanting to complain. I’m happy to do what I can but no matter how much I might want to, I can’t “fix” the problems. It took me decades just to be able to express what I felt was wrong with my own adoption. It is my belief that we will never solve our issues by trying to answer the unanswerable. It has to begin with understanding where things have gone wrong and going from there. It’s not that I want to drown in negativism, but as one very sharp KAD once said (paraphrasing), “We must talk until they listen.” That is one of the things that drive me to write because I fear that the minute we stop talking, people will assume that all is well in adoption-land. For those who presume to know the answer to the unanswerable “better-off” question and choose to use it to justify adoption in general, I would remind them that the “saving” of a child neither ends nor begins with adoption. To view adoption through such a narrow lens presents a danger to the very children people are claiming to save. Such a view may seem to consider all children when in fact; it only affects those “lucky” enough to become adopted. What about those who are never adopted? For those who are, who will hear and help those who struggle with the grief, emptiness, alienation and loss of heritage and birth family? The people who believe they are much better off? “So you would rather they be left in an orphanage to die?” The unanswerable question often gets twisted and shaped into an argument. The flaw in this is that it is based on the presumption that one knows the answer to a question based on another presumption. Why it works is because it puts the one being questioned under a kind of duress. No one in their right mind would answer “yes”. Let us not forget that the flaw is in the question which makes the answer nothing more than a manipulation. Oh, the interpretations that could spring from this one! I see a very nice dessert that I’d eaten in a local Thai place. I loved it so much that I had to learn to make it. That was yesterday’s dessert. 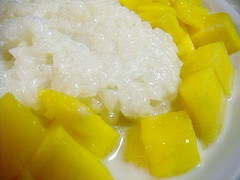 I can foresee this dish of fresh mango and sticky rice swimming in a pool of warm, thickened and sweetened coconut milk becoming one of my favorite comfort foods. I also made one of my daughter’s favorites, japchae (thanks again, Ji-in for giving me the name). A Korean friend of mine made it for us and we’ve been hooked ever since. Luckily, we have a Korean-owned store that carries Japanese, Korean and Vietnamese products. On a side note, I was surprised to find fish sauce at my local grocery store. Seems aspects of Vietnamese culture are also becoming an “in” thing. Should I celebrate or run for the hills? Tonight I experimented with Pho Ga. To my surprise, the kids didn’t look surprised to see what I’d conjured up for dinner. They’re getting use to and probably coming to expect me to experiment with Vietnamese recipes. I’m just now getting familiar with certain dishes and thanks to a long lost Viet acquaintance of mine, even learning to pronounce some of them. Now if I can just find a seasoned taste tester. Oanh, you game? I promise not to kill you though I can’t guarantee against chronic gag-reflexing.